Everyone loves to snack so why not make healthy snacks fun? March is National Nutrition Month and this year’s theme is“Go Further with Food.” It’s all about taking the time to eat smart. This means planning ahead, being mindful of incorporating all food groups and thinking about portion size. Below are 20 Quick, Healthy Snacks to get you inspired! 5-Ingredient Apple Cinnamon Bars: All you need is rolled oats, almond butter, honey, freeze dried apples, and a dash of salt! Get the recipe HERE. Yogurt Spread: Grab low-sugar, plain yogurt and spread it onto graham crackers. Sprinkle cinnamon on top. Mashed Bananas: Mash up 1 ripe banana. Drizzle warmed up peanut butter or sunflower seed butter on top. 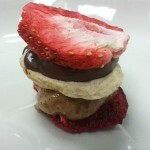 Strawberry-Banana Bites: Layer peanut butter and hazelnut spread onto freeze dried fruit to make these cute fruit stacks. Baked Carrot Fries: Cut carrots into thin fry shaped pieces, cover in olive oil and bake for 20 minutes at 400 degrees F. Sprinkle and toss with Parmesan cheese and garlic powder before baking (if desired). Avocado or Cucumber Turkey Wrap: Slice avocado or cucumbers into french fry sized pieces. Add a light spread of mayonnaise onto a piece of turkey and wrap around a single slice of the avocado or cucumber. 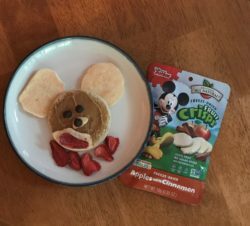 Mickey Mouse Toast: Press a medium-sized circle cookie cutter into whole wheat bread and spread with peanut butter. Use freeze dried apples for ears and freeze dried strawberries for a mouth. Add chocolate chips for eyes and a nose! Banana Crisps Pops: Cover slices of fresh banana or banana fruit crisps with plain Greek Yogurt. Add mini chocolate chips or peanut butter chips. Freeze on wax paper for half an hour. Cucumber Sandwiches: Thinly slice cucumbers and smear your choice of zesty dip or dressing in between two slices to make a sandwich. Mini Fruit Pizza: Use whole wheat English muffins or round pita for the crust. Then smear yogurt or jam on top for the sauce, drizzle with honey and top with freeze dried fruit or fresh fruit. 2-Ingredient Pancakes: Mix two mashed bananas with two eggs and cook like a pancake. Add cinnamon, honey, chocolate chips or another sweet topping when finished. Popcorn Trail Mix: Combine plain popcorn, fruit crisps, and walnuts in a bowl. Then add a light drizzle of melted white chocolate. Mini Grilled Cheese Bites: Cut out bite-size circles of bread, add a tiny piece of cheese and a tomato and make tiny grilled cheese. Hit’s the spot but with less calories! 2-Minute Omelet: Use cooking spray on a mug and scramble an egg inside it. Add bite-sized pieces of spinach, cheese, peppers, onions or any other veggies you’d like. Microwave for 90 seconds. 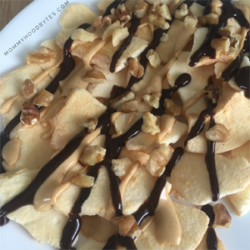 Apple Nachos: Drizzle nut butter and melted chocolate chips over apple crisps. Recipe HERE. Zucchini Pizza: Bake sliced and olive-oil coated zucchini for 5 minutes at 400 degrees F. Add sauce and cheese. Then bake for 8-10 more minutes. Quick Oatmeal Bites: Mix 1.5 cups rolled oats, 1/3 cup maple syrup, 1/2 cup sunflower butter, 1 tsp cinnamon and 3 tablespoons chocolate chips. Roll into balls, chill for 20-30 minutes and enjoy. Cheese and fruit kebabs: Use mini, fun-shaped cookie cutters to cut out cheese. Alternate fresh fruit with the cheese shapes on skewers. Healthier Potato Chips: Bake thinly sliced potatoes coated in olive oil at 450 degrees F for 20-25 minutes. Sprinkle with Parmesan cheese or just salt. Creamy Fruit Dip: Mix 1 cup plain or vanilla yogurt with 2 tablespoons peanut butter. Add cinnamon, chocolate chips or a dash of honey for added flavor. Dip Fruit Crisps in and enjoy!